Sweet Tips Nails is a 3-free Indie polish brand, but it packs so much more than just polish! Offering body butter, lip balm, and nail care products in addition to polish, this is a one-stop shop right on Etsy! 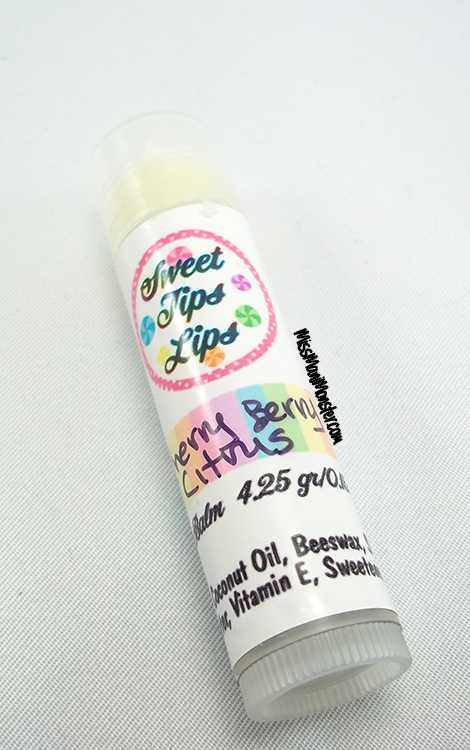 I'll start by featuring the Cherry Berry Citrus lip balm, which is moisturizing and smells absolutely yummy! Sweet Tips has over 35 flavors, and at $2.00 a piece or a set of 3 for $5.00, you can't lose! 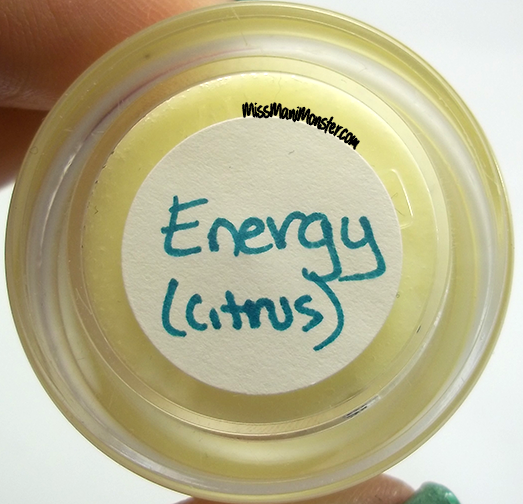 I was also lucky enough to be able to try out the nourishing body butter in Energy, a fresh citrus scent. 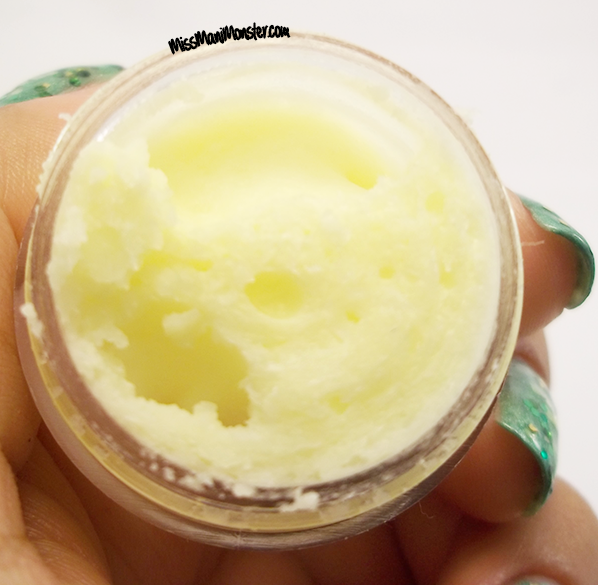 Though it's perfect for hands, feet, and the entire body, I focused on my cuticles! With 44 scents to offer, Sweet Tips has at least a few you'll love! These are available in the size shown for just $1.00, the 2oz size for $3.00, and the 4oz size for $5.75. Onto the swatches! I've got four beauties, the first of which is Tutti Fruiti Beauti, an adorable mix of reds, purples, yellows, orange, green and gold in a mix of shapes and sizes in a pink tinted milky base, inspired by a smoothie! Next is Eden's Garden, a gorgeous blend of pinks, purples, green, yellow, red, white, and peach glitters in a mint, shimmery, milky base. Mixed in are also pink, purple, and light blue butterflies. Next is August's Peridot, a stunning green and gold glitter topper inspired by August's birthstone. I layered this over Polished Mafia's The Grass is Always Greener. Finally, I have September's Sapphire, a rich, blue glitter topper for all you September babies! I layered this over Zoya's Natty. All minis and full sizes can be found at Sweet Tips Nails on Etsy, at $3.75 for minis and $8.50 for full size. Sweet Tips Nails takes custom orders, and all polishes have a scent add-on option to make your polish *truly* custom! Please don't forget to also check Sweet Tips Nails out on Facebook! Peridot reminds me of st patrick's day, very pretty! I thought so too! I"m going to have to come back to it!! Thanks so much for reading! I appreciate your comments, questions, tips, and support! The Happiest Nails On Earth! Header & background images by Heather at Miss Mani Monster. Powered by Blogger.